This might work. It's not like Obama tapped Dr. Phil to be his Surgeon General or Dr. Laura or Dr. Carter from ER. 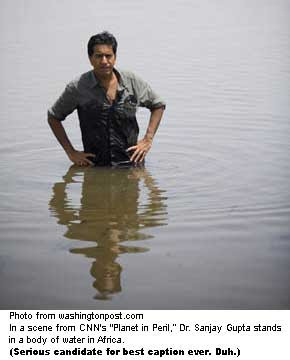 Dr. Sanjay Gupta is a real doctor; he doesn't just play one on TV. He's a brain surgeon. He still performs brain surgery at Grady Memorial Hospital all the time. He stood up to Michael Moore. When he was embedded in Iraq as a journalist covering a Naval medical unit, he stepped in to perform brain surgery on several patients. He's good in front of the camera, good with the press (hell, he is the press) and knowledgeable and relevant issues like obesity and health care. He's got fans, called Gupta Girls, who maintain a Web site with "Pretty Pictures" of "The Sexiest Doctor on the face of the Planet."